Dillon Hill Inn and Cabins is a One of a Kind Experience! Built in 1836 the main house is a true Adirondack lodge historically serving people from all walks of life. After an adventurous day in the Adirondack Mountains retreat to one of our 5 uniquely decorated guestrooms with private baths, or kick back in front of a beautiful stone fireplace with a glass of wine or a cup of tea and a little something freshly baked. 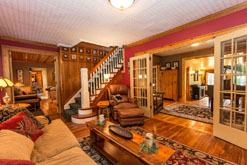 Dillon Hill offers a unique bed and breakfast experience with the friendliness and individuality that people of the Adirondacks are known for. The cabins at Dillon Hill are a home away from home perfect for 1-2 couples, a family or a small group. With your privacy in mind the cabins are set about 500 feet apart. They each have two bedrooms with private baths and a center common room which includes a living area with stone fireplace, dining area and kitchen.